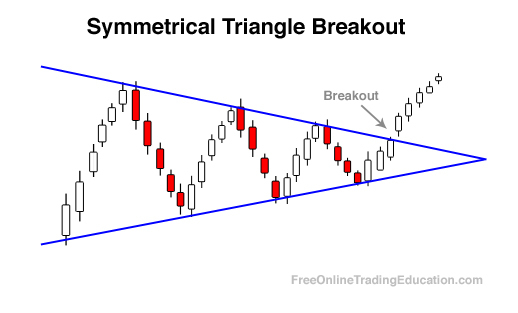 A Symmetrical Triangle Breakout pattern is identified by the distinct shape created by two converging trendlines symmetrical in nature. The pattern is formed by two trendlines that connect a series of sequentially higher swing/pivot lows and a series of sequentially lower swing/pivot highs. Price action is largely contained within the triangle formation and traders typically look for buying opportunities once the price breaks out above the upper trendline of the triangle. Put another way, when price action forms a series of lower swing/pivot highs and higher swing/pivot lows a Symmetrical Triangle is created. 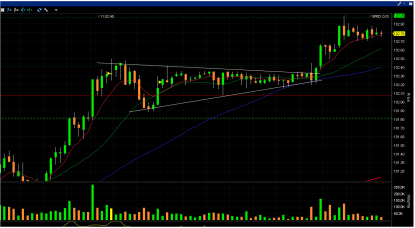 Symmetrical Triangles can breakout in either direction since this consolidating pattern has equal sentiment driving the formation. Within an uptrend, the possibility of a breakout to the upside can increase due to the overall momentum of bullish sentiment supported by the potentially significant amount of underlying support in the chart. As with any patterns, Symmetrical Triangle Breakouts are carefully assessed by the technical analyst because of their ability to produce subsequent upside or downside price action. Analysts will use other charting cues to place the odds in their favor of the upside price movement.